Buddha said, “Holding on to anger is like grasping a hot coal with the intent of throwing it at someone else; you are the one who gets burned.” Counseling a client with this wise saying, she retorted, “Forgiveness is not a concept in my religion.” Well, we are all holding on to anger of one sort or another, against one parent or another, an ex-lover, ex-husband, ex-employer, etc., and the book, Forgive to Win by Walter E. Jacobson, M.D., explains fully and completely why it’s necessary and in our own best interests to let it go, whatever your beliefs. There are many wonderful books on Forgiveness already on my bookshelf, but I welcomed this one because it lays out a structured daily program, it’s not just a philosophical treatise. The steps suggested help train ourselves to let go of self-sabotaging behavior and learn to love ourselves – by loving and forgiving others, no matter what they’ve done. Once our self-esteem is raised to the heights possible through self-love, there’s nothing you can’t achieve. Forgiveness may seem like an easy task, but it’s not. And Dr. Jacobson guides the reader in how to forgive. His “Forgiveness Diet” is a unique set of recommendations to help us establish and maintain the 90-day commitment to acts of kindness and forgiveness that could literally change one’s life. 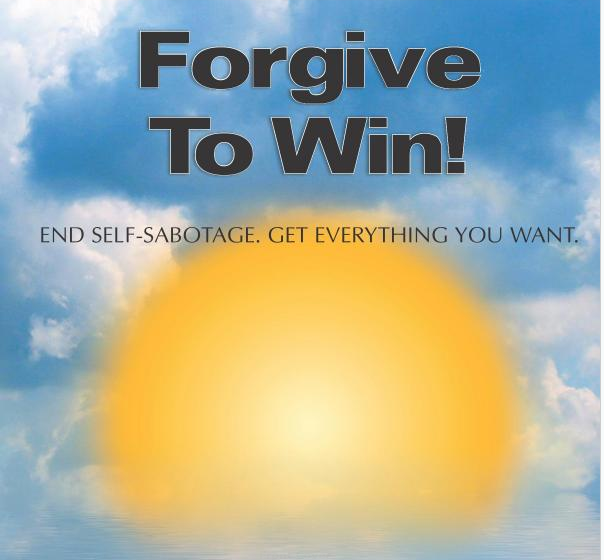 He also includes Forgiveness Affirmations and Visualizations that I have already used to great benefit. Looking at it from the vantage point of health, anger throws us off-balance and creates tension that can lead to chronic pain and disease. Forgiveness opens the floodgates of our body’s own healing energy, and keeps us grounded, alert, empowered and able to recognize opportunities for success. The practice of forgiveness is one of the tools to opening the Heart Chakra, but many choose to hold onto their anger – feeling it gives them power, or will keep them from getting hurt again. Nothing could be further from the truth. The last chapter of Forgive to Win is entitled, “Getting Everything You Want!” If you don’t already have it, it’s time to get this book.